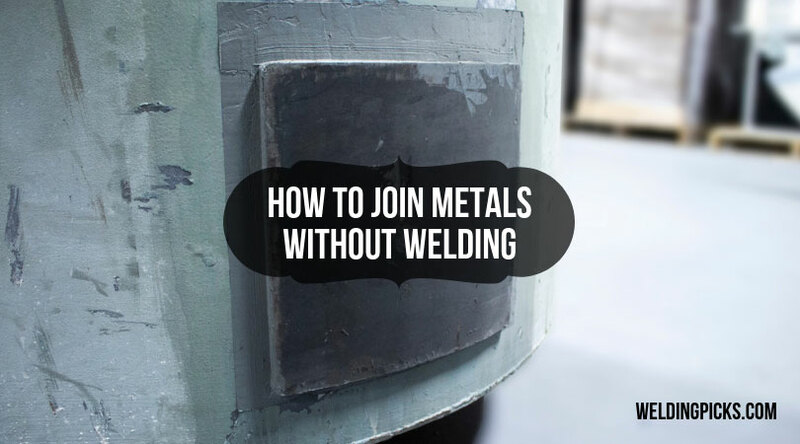 How to Join Metals Without Welding? Hi, I am a mechanic working at a workshop for a transport service company. I mend and repair cars which are wrecked from an accident in my area. I have been welding throughout my life. Precision welding is an art, no doubt about it. Good welding doesn’t always need a good welder; it also requires proper equipment and supplies. Not everyone has all the resources, and also a situation like this might arise when you’re in a place where you don’t have the welding rig at the moment. It will be valuable knowledge to know some of the ways to join metals when you are deserted. At times, it will be cost effective to use this way rather than using welding as a process of joining metals. There are multiple ways to connect metal. I will be giving some ideas of the ways and these are very useful, and lots of expert welders are practicing these kinds of stuff from a very long time. I improvised some techniques which helped me to succeed in life. I will be mentioning them here in detail. This is a process by which the metals are pressed against each other by hardware. Usually, the metal sheets are overlapped that have a punched-out hole or a drilled area which hold them together. These types of hardware include nuts, bolts, and screws. Moreover, if you weld, the process makes the metal sheets permanent for life, but in mechanical assembly, you have the advantage of removing it when needed. In this process, the two metals sheets are placed together side by side, keeping a shared space which needs to be drilled. So, when the joint space is drilled or made punched holes, a bolt and nut are inserted in the hole to keep the sheets of metal steady. These types of method are used in aircraft and ships. The benefit of this method is that the metals can withstand a change in temperature. But also keep in notes, this is permanent, no changes can be done. Brazing is a process of joining metals which can act similar to adhesive formula. It may sound easy, but you will be needing industrial grade equipment to move forward. Which involves making a metal filler above 800 degrees Fahrenheit by heating it in an extreme hot temperature. So, when the filler makes contacts with the metals with each other, it holds them up aggressively together. This is quite similar to welding but it can be done inexpensively. Now think of a scenario when you have to weld in place of the metal where you cannot reach with the welding gun. Brazing can be done here. It is somewhat similar to the Brazing process. However, in this process of joining metals, the fillers are quite colder to the fillers of brazing. To unite to strong metals, brazing is needed. But not all cases are for strong metals. In case of lighter metals soldering is perfect. Brazing can wear off the soft metals and can be a huge mess if proper procedure is not maintained. Usage of glue has been around from 4000BC. In ancient times, people used to use blood, animal skins, bones, and brain matter to stick things together. Ancient Egyptians showed a revolution when they started using glue to make furniture. Just like that, glue can also be used to join metal with metal. Not with organic matter but yes, glue is somewhat effective. In terms of glue, the process is not that efficient, and it is not as durable as welding or other methods that I have mentioned. Some types of glue that are used for metal purposes are tapes (e.g., 3M tapes), silicone (e.g., Loctite), polyurethane (e.g., Gorilla glue) and epoxy (e.g., JD weld). This is an interesting method, in which some expertise is needed to perform this. I find this very effective and durable to join metals. As I mentioned earlier in the article, that what if you don’t have welding equipment with you on the spot, but there is an emergency need for welding. Well, this is what I was talking about, I learned this method when I was traveling in Turkey. I pretty much wrecked my car, and the front bumper needed to be joined to move forward. Some local technician showed me how to do it. You will need two copper alloy electrodes, and the thickness of the metal shouldn’t be .020 to .12 in thickness. Point to be noted, thicker metals are more difficult to spot weld because the larger electric current needs to flow through the electrodes. Electric current is flown from the electrodes to the spot where the electrodes are holding in place to get welded. Also, this only works on the spot where the electrodes are placed. Throughout history, joining metal is one of the revolutions that has been discovered. Without this, we would be still in stone ages, crafting stones and statues. Metal is one of the greatest things that we can craft anything with. Tables, chairs, planes and cars, everything is made of metals that are found in the cores of our mother planet earth. Metalworks would be absolute if we couldn’t join them together. Just like a sculptor, the metal works can divine a masterpiece. We get accustomed to the daily thing to do in life. Just like that, we are habituated with standard welding processes to join metals. But there are also other many ways to connect metals, and there are many new ways to come shortly. Technology advancement will surely make us more efficient in the coming days. I also strongly recommend people to try other ways to join metals.